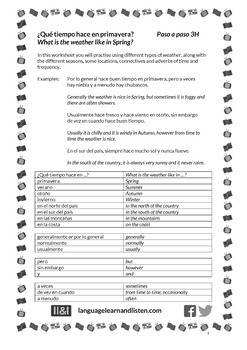 In this worksheet you will practise using different types of weather, along with the different seasons, some locations, connectives and adverbs of time and frequency. There are 2 exercises (Spanish to English and English to Spanish) and all necessary vocabulary is provided. Suitable for all levels of ability. Answers provided.